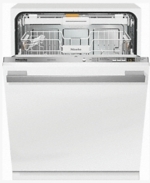 The 24" Classic Plus Series Built-In Dishwasher from Miele will be the best addition to your place. The dishwasher features 5 wash programs to meet your washing demands. The Patented 3D Cutlery Tray is adjustable in three directions for any sized items. Patented 3D cutlery tray: The new dimension of cutlery care Even for bulky utensils: The height, width and depth of the patented cutlery tray can be adjusted. Comfort basket design: Dishware can be loaded easily and securely for optimum results. Ergonomic basket handles Simplify your daily routine: The basket handles make loading and unloading easier. DetergentAgent Perfect results: The DetergentAgent perfectly adjusts the process to the detergents used. Hot water connection Every Miele dishwasher has the ability to connect to hot water. Double WaterProof System The DoubleWaterProof system automatically shuts off the water supply in the event a leak is detected. In America, no dishwasher is quieter than a Miele Barely acoustic: With low noise levels from 41 dB(A)4 and consistently perfect results. ComfortClose: Practical: The door is extremely easy to open and close, and stays open in the desired position. Delay Start: Delay Start: The start of a program can be programmed up to 24 hours in advance. Countdown indicator : Keeping you informed: The countdown indicator lets you know how long the program has left to run. Normal: The program is sensor-controlled for normally soiled dishware. Pots & Pans Maximum cleaning performance: Pots, pans, etc. are cleaned residue-free. SaniWash: This is our high temperature program offering deep cleaning results. Express Short program duration: Cleans mixed loads with fresh food deposits in only half an hour. Short : When things have to be done quickly: With the Short program option you can reduce the cycle time by up to 50%. Rinse & Hold: To avoid the development of odors, dishware can be pre-rinsed without the need to run a complete program.